Risk hedging of Trade Receivables through securitisation. We offer alternative financing methods by liquidating trade receivables. In addition to an individual buyer scheme, we also offer various risk hedging schemes for a diversified receivables pool. Hermes Cover, a common name for the German ECA (Export Credit Agency), is an export credit guarantee by the German government, which protects corporations in Germany from payment defaults of foreign debtors. In order to support the export businesses of our customers, we can provide importers with a loan (Buyer's Credit). By proposing the financing package to importers, exporters can differentiate themselves from other competitors during negotiations on export contracts. Advice on Treasury Transactions. Our experienced staff can advise you on various hedging methods against currency and interest risks. 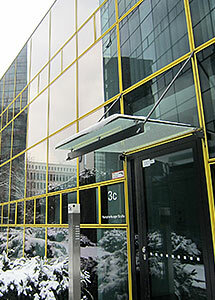 The Munich Office was established in 1986. Effective Apr 2018, the office was transferred under MUFG Bank (Europe) N.V.
Munich is Bavaria's hub and one of the major economic centres in Germany. Research and development thrive here, and many universities, research institutions, and head offices of internationally known industrial companies are located in this city. Investments by Japanese customers into southern Germany are increasing, and our sub-branch covers almost all Japanese-related customers in this area with full banking services.